This copy of the Four Gospels has notes on the final flyleaves relating to S. Augustine's abbey, Canterbury, and the main scribe has been identified as the scribe of a number of other Canterbury books, which makes it almost certain that this manuscript was written there. 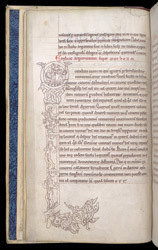 At the top of this initial 'I' it appears that a devil holds a large bowl of food and is offering it to a monk. Below are a sainted monk, a naked male figure, and a half-human, half-beast demon.